Top Retail & Wholesale Suppliers. Ship Canada Wide To Your Door! stair treads, metal spindles, hand railings, box newel post, extra thick treads, etc. ship our stairs & railings Canada wide. 2,500+ stair parts orders in the last five years, you can buy from us with confidence. We ship stair parts to all Atlantic Provinces & Canada Wide. Prefinished Stair Parts in clear coat and stain finish. Custom stain match hardwood stairs & rails to your flooring sample, MinWax stain, or clear coat. Specializing in existing rail & staircase renovations and new home stairs in Nova Scotia. Greater Halifax ( HRM ), Valley, South Shore. 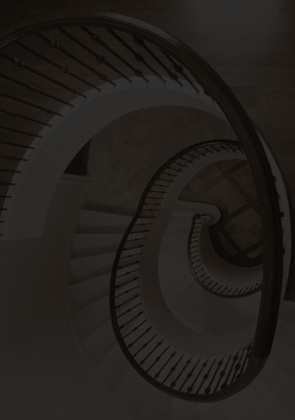 With all the different staircase components & terminology for stair parts it can get confusing. Get detailed stair definitions here. GET GREAT DISCOUNT PRICES & GET THE GREAT QUALITY YOU DESERVE: Buy stair parts direct in Canada from us to design the staircase of your dreams. We carry stair treads, metal balusters, stair railings, box newel post, extra thick treads & more, in many hardwood types. Raw or prefinished stair parts for: private home owners, contractors, developers & supply stores. Our main focus is to be the best stair parts suppliers & manufacturers Canada wide. We Are One Of Canada's Largest Retail Stair Parts Suppliers: We offer the following 3 key factors in ever sale we have ever done: great discounts, great customer service, and great products. We also have a custom spray booth shop, so we can offer pre-finished stair parts. Smart Consumers Do Their Homework First: Get a FREE QUOTE from us Today before you buy stair parts from any of the big building supply stores like: ACE LumberMart©, Castle Building Centres©, Home Depot©, Home Hardware©, Kent Building Supplies©, Lowe's Canada©, Rona©, Timber Mart©, Etc. We offer high quality Candian made hardwood stair parts at discount prices & we ship right to your door! * Click On The Banner Below To View Our New Mobile Friendly Metal Balusters Web Site: We have many new designer colors and styles in both round and square shafts, even the latest geometric iron spindles ( stainless steel, designer white, urbane bronze and more ). NEW... many metal baluster orders now qualify for our NEW FREE SHIPPING PROGRAM both Canada & USA Wide ( see details here ). In-Stock Wood Types: Yellow birch, red oak, hard maple and pre-finished white. White Ash & Knotty Pine Price Note: We offer almost all of the items listed on our web site in white ash hardwood and knotty pine softwood. 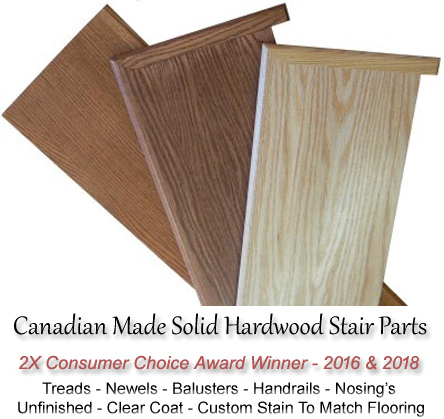 For customers looking to buy from Stair Parts Canada, we simply sell "almost all" our ash and pine stair parts at the exact same prices listed for our oak stair parts on our web site, some prices may even come in at a lower cost ( so use the listed oak product pricing as a guide to get your white ash and knotty pine product ball park costing ). Stair Parts Canada © Are Retail Suppliers & Manufacturers Of Quality Hardwood Stairs. It's our word that you can count on great product, great prices and great service. Stair Parts Canada © mission is very simple: 'to provide high quality stair parts at an affordable price to all consumers'. We stock many types of stair railings & stair parts: wood stair treads, hardwood balusters, newel post and hand railings. Custom millwork and stair parts and stair treads & components in many wood types: ash, birch, cherry, jatoba, maple, hickory, knotty pine, mahogany, oak, walnut, white. We make custom stair treads: oversized extra wide or extra thick, false stair treads, pie shaped treads for curve staircases & winder sets ( also bamboo stair treads & bamboo stair parts on special order ). We also have our very own in-house custom millwork shop, so feel free to send us your "not so normal request". Are you a Home Owner, Wholesaler, Distributor, Contractor, Developer or a Retailer that owns a Hardware Store? If you answered yes, let us take care of your hardwood stair parts supply needs. Please Do Contact Us Today For Your Discount Rates!